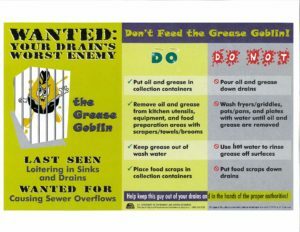 One of the Town of Norwood’s worst enemy to our sewer system is Grease. Sure, we know that you just want it gone and often times the kitchen sink tends to be the most convenient,but don’t do it. Please see our little chart featuring the Grease Goblin. We have locked him up at the moment and provided a helpful list of Do’s and Don’ts.